If you have never been snow shoeing what is stopping you? Snowshoeing has been around for thousands of years. 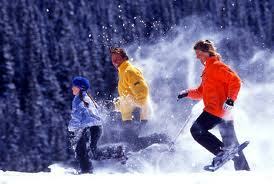 And, obviously, the art of snowshoeing has become more sophisticated over time – now it’s considered a winter sport. From the early wood-frame to the aluminum-frame models, snowshoeing has garnered quite a following throughout the world. Modern day snowshoeing is made up of casual snowshoers who hike trails for pleasure, the snowshoeing enthusiasts who trek through the backcountry, and the competitors who race. There is no better way to begin snowshoeing than just going and doing it. Take a risk, rent or buy a pair of snowshoes, dress for the elements and enjoy.